I collect old Life Magazines from the 30’s and 40’s when I can get them cheap enough. I’m fascinated by the reporting of history in the issues of Life as well as the snap shots of Americana from the time my parents were coming of age through the WW2 years. Recently, a friend gave me 1\2 dozen magazines from my desired time frame. In the May 9th, 1938 issue of Life,there appeared a small article titled, Pastor Gives 1,000,000-Volt Sermon. It was a poor initial judgment on my part since the article dealt with a man who seemed to be ahead of his time in trying to prove that real science is not incompatible with the Bible at all. His name was Irwin A. Moon. According to the short article accompanying the picture below, Moss studied physics and chemistry while preparing for the ministry at Los Angeles Theological Seminary. When Moon pastored a small church in California he experimented with high-frequency electricity. By 1938 he was traveling throughout the US for Moody Bible Institute preaching Sermons in Science. The “stunt” pictured above took place in Atlanta, GA. Moon received a 1,000,000-volt charge of electricity, expelling it from metal caps on his fingertips that resulted in crackling streamers of fire. A little research on my part turned up that Moon became the Director of Moody Institute of Science. He passed away in 1986. I was an extension student at Moody in the 1980’s and I had never heard of Moon, but was aware of his legacy then called “Wonders of Science.” Moody had (has) an excellent series of videos that illustrate, as the title implies the wonders of science. I fondly remember the nature type videos that would explain the design\complexity of a woodpecker or how certain insects had unique features that pointed to design. This was Moons goal–to show that Creation had\has intelligent design and the intelligent designer is the God of the Bible. Today Moon’s legacy is carried on by many creation scientists and scientists. The Moody Bible videos on nature and science are available in DVD form on Amazon. One of the links from Al Mohler’s The Briefing is titled, What Christianity Would Look Like Without Hell. The author is John Shore author of a book titled Unfair: Christians and the LGBT Question. Shore insists that Bible believing Christians who believe such things are naïve. My comment: This statement sets the tone for all of his other statements. It is based on Shore’s presupposition that God is love and nothing but love and Shore gets to define what that love looks like by assuming that God is a God without wrath. It could mean to Shore that there is no such thing as sin and therefore no need for Christ to die on the Cross, taking the wrath of God upon himself in the atonement. On the other hand judging by this statement and Shore’s other statements Shore is actually a universalist meaning that all people are saved regardless of what they believe. Whatever the case Shore is well on his way to inventing his own religion. My Comment: Shore is insisting even demanding a Christianity void of absolutes and void of all doctrine except for the doctrines he finds acceptable and redefines to make them acceptable. Shore’s source of authority is Shore. Shore’s concluding statement above smacks of the intolerance of the LGBT movement that demands conformity to their beliefs. My comment: I can only surmise that Shore has no use for the Jesus of Scripture since Jesus speaks more of hell than he does of God’s love. My comment: This statement is interesting since Shore is making an attempt to quote the Bible. He paraphrases the second great commandment (Matt. 22:37-39). The commandment is in the context of the Pharisee’s testing Jesus in regards to the law (Ten Commandments). Shore paraphrases the second summation of the commandments while ignoring the first; the command to love your God with your whole heart, mind and soul. Shore is cherry picking a verse out of its context and then defining for us what he thinks Christ meant by loving our neighbors. Presumably, loving our neighbors would not mean telling them about hell. Shore clearly does not believe there is a hell while Jesus certainly did. My question to Shore would be that if Jesus is right and Shore is wrong and there is such a place as hell would it be loving to not tell people about it? Again, what we see here is Shore setting himself up as his own authority, his own interpreter of Scripture as it suits him. Shore practices the age old error of getting the Bible to say what you want it say to say rather than what it actually says. My comment: The arrogance contained in these statements is breath-taking. Shore’s entire argument is based on Shore being his own authority and driven by his agenda for a Christianity that has no need for a Savior. Yet, he has the audacity to say that his version of Christianity is more biblical and more in keeping with the spirit of Christianity. Wow! Personally, I wonder why Shore and those that agree with him bother with the label of “Christian” at all. Shore’s gospel is the gospel of anything goes and that is no gospel at all. Beyond Redemption_P4 What do the Scriptures say? A thought provoking and excellent read and a real tribute to a man who had to over come the emotion of ministering to war criminals for the sake of the gospel. A number of years ago I counseled a man in the church I was serving in. The man had a burden for his father who was dying in a VA Hospital. The son’s burden was that the father would respond to the gospel even as he lay dying. The dying man was a World War 2 veteran and had lived a life apart from Christ. According to the son the son’s childhood had been a living hell with frequent beatings, drunkenness and spousal abuse. The father had few friends and had alienated all of his family. Now, he lay dying from cancer. The father was hated by nearly everyone who knew him and when he finally passed away only six people showed up at the funeral which was held in a VA Chapel. One of the people who came didn’t even know the deceased and just wanted to honor a veteran in some way. The other person who did not know the deceased was me and my job was to give a short message to a very small crowd of five. The father, in some sense was a war criminal, guilty not necessarily of war crimes but guilty of some pretty horrible crimes against his family and many others. He was not a nice man without any perceived redeeming qualities what-so-ever. 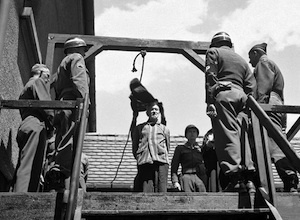 Death by hanging was the fate of many tried by the Nuremberg Tribunal. When I counseled the son (prior to the father’s passing) my text was the same as the one that resonated with Pastor Gerecke when he was asked to minister to the Nazi war criminals at Nuremberg. 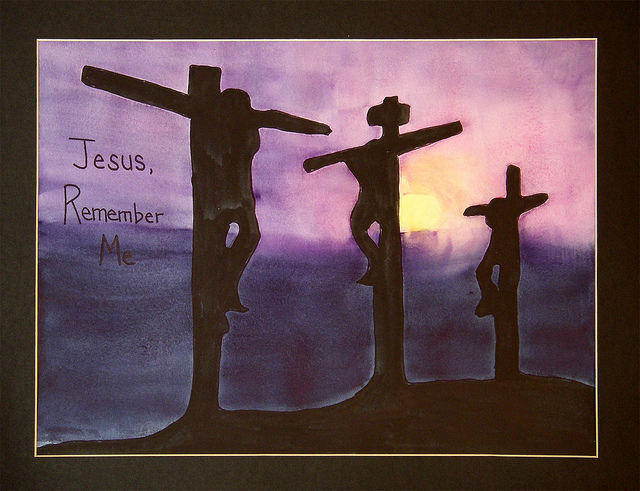 As we can see from the text Jesus was crucified between two criminals usually identified as thieves or robbers. Robbery suggests murder and capital punishment as opposed to petty thievery that would not require the death penalty. 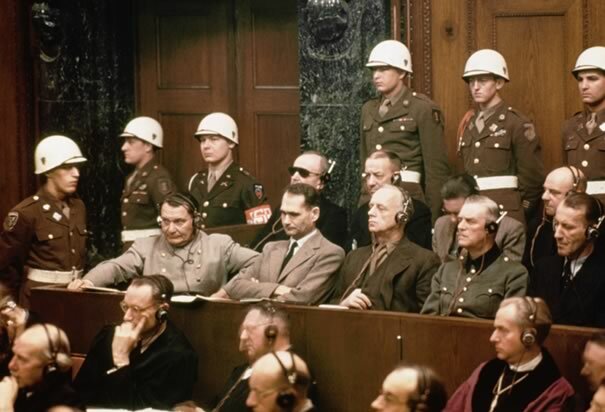 Most of the Nuremberg defendants believed they would be hung while the two thieves knew for a fact they would die because they were already on the gallows so-to-speak as represented by the crosses they already hung on. The parallel between the two sets of condemned men is obvious. Are men facing death for their crimes capable of genuine repentance and the forgiveness of their sins? Let’s examine the text to see if there is any evidence that the thief’s conversion was genuine. The first observation we can make from the text is that Jesus assured the thief that on the very day he would be with Jesus in Paradise. That is compelling textual evidence that the thief was truly converted but there is more. The parallel text in Matthew indicates that at first both thieves mocked Christ (Matt. 27:44). At some point the second robber stopped mocking Jesus and instead asked for salvation. If you were to read the rest of the story you would see that certain signs and wonders would follow this incident. The second robber made his request for salvation before any of the signs and wonders took place thus indicating something else convinced him to repent. We can also note that the text records that everyone around the crosses were mocking Jesus; the crowd, the soldiers, the robbers, the scribes and Pharisees, everyone. To repent and ask Jesus for salvation would mean the robber had to swim against the tide of popular opinion and the mockery of the Savior. The second robber also rebuked the first for not fearing God. The second robber clearly recognized Jesus’ innocence and it suggests a recognition of Jesus’ deity. The rebuke of the first robber was for being irreverent. In other words the second robber went from being a mocker himself to someone defending Jesus in a very short time. What could explain this apart from a genuine change of heart? Remember what Pastor Gerecke had said about his former SS Lt. Colonel who played the organ at the worship services. He said of the man, “the simple Gospel of the Cross had changed his heart.” So it was with the second robber. This is a key point. For any of the Nuremberg defendants to be genuine about repentance they would, like the robber, have to realize that Jesus was innocent of everything and that he was indeed God who was dying for the genuine crimes of others! The second robber asks Jesus to remember him in His kingdom thus recognizing that Jesus’ kingdom is not of this world. Jesus grants him the request; the guilty dying for the innocent and the innocent paying for the guilty party’s sins. As the first robber and others mocked Jesus by telling Jesus to come off the cross and thus do a miracle (he saved others and cannot save himself) the second robber recognized Jesus did not have to come off the cross to save anyone because Jesus simply had the authority to save. Furthermore, the second robber noted his own guilt and the fact he deserved death. He asked Jesus for salvation on the basis of mercy and grace with nothing to offer in return. No good works, no self-justification, no excuses. He just relied upon Jesus mercy and grace which is all we have to appeal to in salvation. Luke does not say what changed the second robber’s mind at that late hour. In order to discover that answer we have to look elsewhere in the Bible. In John Chapter Three Jesus told Nicodemus that the process of being born again is a mysterious working of the Holy Spirit-the results are evident, but the process is unseen. The second robber showed evidence of a changed heart. I think all would agree, but what changed his heart? And so it is with all who believe, you, me, a robber on a cross, a Nazi about to be hung. Salvation belongs to the Lord declared the prophet Jonah (Jonah 2:9) meaning that salvation is a sovereign work of God from start to finish just as it is the secret work of the Holy Spirit in the hearts of men that we can only see the results of. We judge people by the scope and magnitude of their sins and thus minimize our own by comparison. I’m not as bad as that father who beat his wife and children. I’m not as bad as the drunk next door. I’m not as bad as the pornographer, the robber or murderer and certainly not as bad as any Nazi. All of those statements may be true from a human, self-righteous point of view with the person making the statements never realizing that they have within themselves the capacity for every one of those heinous sins. The old statement, that there by the grace of God go I rings true. While we may differ in the scope and extent of sin Scripture in an individual’s life is quite clear that all far short of the glory of God. Peter is informing those hearing the sermon that they are guilty, either implicitly or complicity in killing the Son of God even though they had ample proof of his deity. Paul considered himself the foremost among sinners because he persecuted the church and was complicit in the murder of Stephen. Paul was an example of God’s mercy and grace. Once a hard-hearted Pharisee that persecuted the church in the hopes that people would not believe; now the apostle to the Gentiles (anyone not a Jew) preaching the good news that anyone no matter what they have done can be saved. Pastor Gerecke recognized these truths. Once more he recognized that these truths could apply to even the worst of the Nazi war criminals and so he agreed to work with them. On a human level it’s nearly incomprehensible that some of these men could be forgiven by God for their crimes but we forget that God forgave the apostle Paul and the crowd that repented at Peter’s first sermon. God’s ways are not our ways and we should rejoice in that for it should give us, the foremost of sinners hope that we have a Savior who can and does save even the worst of the worst. This side of heaven we will never know who among the Nazis at Nuremberg was genuinely repentant. All we have is Pastor Gerecke’s testimony and what he believed about men who believed they were about to die. And that perhaps is the greatest take-away from Pastor Gerecke’s mission to the Nazis, all die, all had an opportunity to repent and seek forgiveness; some did, some maybe and others clearly did not. The question then becomes what do we do with our sin because we too will die. 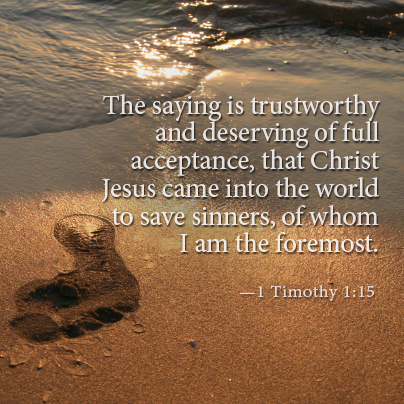 Thank God for his mercy and grace to all those who truly repent and believe upon Jesus as their Lord and Savior. 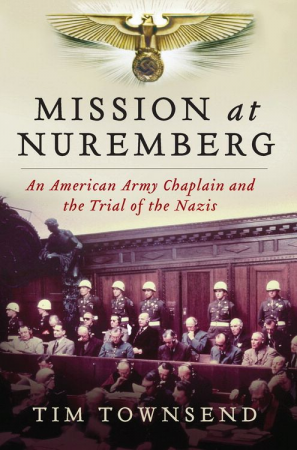 I recently finished author Tim Townsend’s Mission at Nuremberg-An American Army Chaplain and the Trial of the Nazis. During the reading of the book a flood of Scripture came to my mind in the different sections of the book. Some were the Scriptures quoted in the book but many were not as I considered the man who ministered to the Nazis at Nuremberg, Pastor Henry Gerecke (LCMS). The two passages that kept coming to my mind after I finished the book were Acts 2:22-24 and Acts 2:37-39. Both passages are in the larger context of the apostle Peter’s Pentecost sermon and both passages, speak volumes to the situation that Pastor Gerecke faced at Nuremberg when he accepted the assignment to be chaplain to men accused of waging an unjust war and for the extermination of millions. I will come back to the passages in a later post. 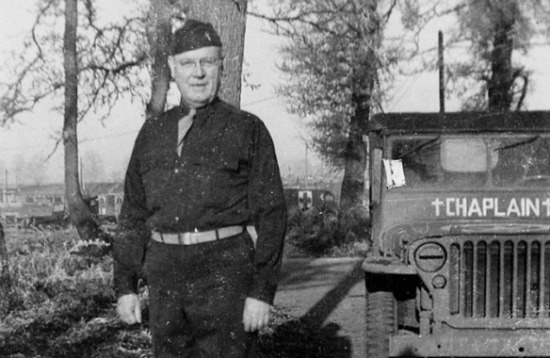 Pastor Gerecke barely made it into the chaplain’s corps of the US Army. The age limit was 50 and Gerecke just made the cut of by a couple of weeks. Gerecke was from Missouri, a state that had a high proportion of German immigrants. 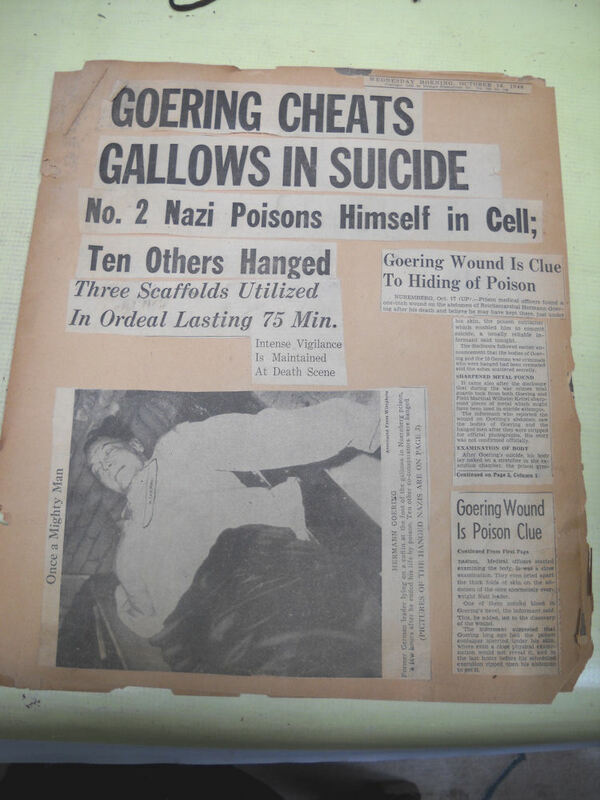 Gerecke was fluent in German a fact that contributed to him being asked to minister to the war criminals, Gercke had also been a minister to criminals within the St. Louis jail system, an experience that helped prepare him to minister to criminals of a different sort. Prior to the war Gerecke served as a local church pastor but really did much more. It seems he always had a heart for the down and out, the type of people who seem to have been forgotten or the type of people who seemed to need the most spiritual help. To Gerecke the men on trial were in most need of spiritual help since it was almost unthinkable that any would escape the death penalty and all would face their Creator shortly. According to Townsend Gerecke’s reputation as a pastor and evangelist was second to none and if he had any enemies Townsend does not record them. Gerecke’s deployment took him to Great Britain where he gave excellent service at a major hospital giving comfort to the wounded and the dying but also ministering to the enormous staff that populated the base. He seemed tireless in his work and was loved and admired by all he ministered too. He followed the hospital unit to France and by the end of the war to Munich in the German state of Bavaria. From there he was asked to go to Nuremberg and minister to the top surviving Nazis who were incarcerated. As we look back almost 70 years the concept of a trial for war crimes does not seem out-of-place or even unusual. The US and Great Britain have prosecuted their own soldiers for war crimes committed in Iraq and Afghanistan and when they do it’s usually big news. The Nuremberg trials were something different at the time and unique in many ways. For the first time the major leaders, both military and civilian would be brought to trial and held to account for their crimes. The prosecutors came from the four major powers that included the US, Great Britain, France and Soviet Russia. The inclusion of Soviet Russia in a trial about war crimes must have struck the other allies at least a bit ironic. Nevertheless, led by the US and Great Britain the western allies decided the trial would not be about vengeance but instead would focus on justice. They wanted the world to remember what the Nazis did in the hopes that the world would learn and that such a government would never rise again to wreak such havoc on mankind. In retrospect, it was naive but the allies were serious about justice and wanted to present to the world a fair trial to those who never would have done so to their enemies. 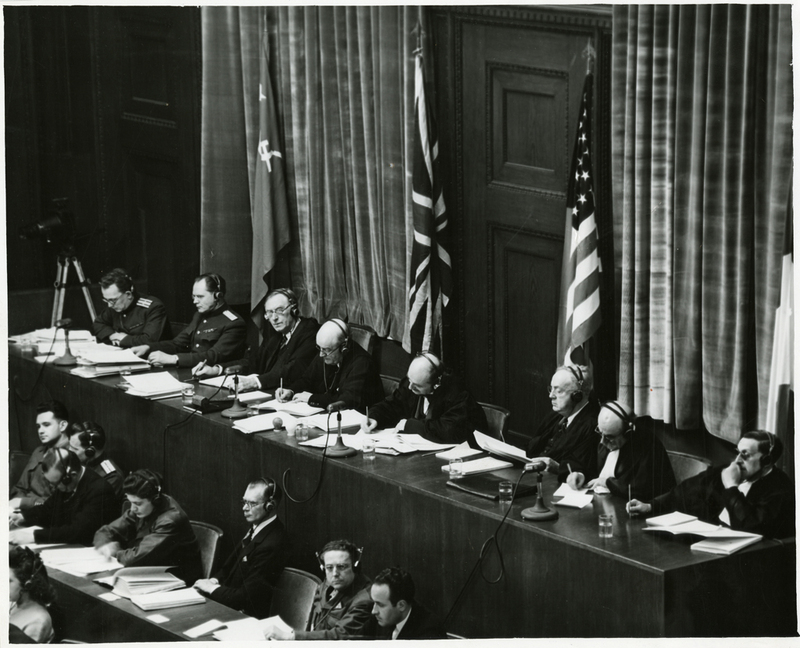 The western allies gave considerable thought to the trial as they were breaking new ground. They even considered the spiritual welfare of the war criminals some of whom were the most hated men the world has ever known! The two men who eventually got the job of ministering to the Nazis were Pastor Gerecke for the Lutherans among the them and Catholic priest Father Sixtus O’Connor for the Catholics. Father O’Conner also spoke fluent German. Gerecke’s initial reaction to being asked horrified him-ministering to vile men who had caused so much death and destruction. He didn’t want to shake their hands much less have a chat over spiritual things. He asked himself how could he try to bring comfort to men who had caused so much heart ache. He recognized there was a difference in ministering to burglars in St. Louis and those accused of mass murder and waging an inhuman war. Scripture is what turned Pastor Gerecke’s mind around. Luke 23:32-43 in particular ministered to Gerecke before he could minister to the Nazis. With this passage Gerecke realized the possibility of redemption existed for even the worst of the worst. I will deal with this passage at length in a later post. Gerecke realized that if there was an opportunity to love the sinner and not the sin this was it and so he accepted and he became chaplain/pastor to the 15 Lutherans while O’Connor had the smaller flock of 6 Catholics. 1. Participation in a common plan or conspiracy for the accomplishment of a crime against peace. 2. Planning, initiating and waging wars of aggression and other crimes against peace. The general idea was that indictments #s 1 and 2 involved the major military and civilian administrators that enabled Hitler and the Nazis which led to wars of conquest, the committing of war crimes and crimes against humanity that included but were not limited to the holocaust death camps. In other words it was possible for a defendant to be convicted in four ways or one way or anything in between. Depending on the conviction an appropriate sentence was carried out. Below is a list of the defendants, what their role in the Nazi government was and the sentence they received. They are in alphabetical order. 1. Karl Donitz-head of the German Navy after Raeder, received 10 years in prison. 2. Hans Frank-governor general of occupied Poland, death by hanging. 3. Wilhelm Frick-minister to the interior authored race laws, death by hanging. 4. Hans Fritzsche-headed the news division of the ministry of propaganda under Goebbels-acquitted. 5. Walther Funk-Hitler’s minister of economics, sentenced to life imprisonment. 6. Herman Goering-highest ranking Nazi to be tried, head of the German Air Force and was Hitler’s designated successor, Goring’s sentence was death by hanging but committed suicide the night before the execution. 7. Rudolf Hess-Hitler’s deputy fuehrer until he flew to Scotland in 1942 in a weird attempt to broker peace, received life in prison. 8. Alfred Jodl-General, Chief of Operations, death by hanging. 9. Ernst Kaltenbrunner, high-ranking SS officer who had much of the responsibility for the death camps, death by hanging. 10. Wilhelm Keitel-head of the German Army, death by hanging. 11. Gustav Krupp-industrialist, found innocent of the charges but later charged for crimes that did not merit the death penalty. 13. Franz von Papen-diplomat, found innocent of two charges acquitted of another two, later retried for lesser offenses and went to prison for eight years. 14. Erich Raeder-head of the German Navy prior to Donitz, life imprisonment, released after ten years. 15. Joachim von Ribbentrop, minister of foreign affairs, death by hanging. 16. Alfred Rosenberg-racial theory ideologist and minister of the eastern occupied territories, death by hanging. 17. Fritz Sauckel-planner of the Nazi slave labor program, death by hanging. 18. Dr. Hjalmar Schacht-banker and industrialist, acquitted. 19. Baldur von Schirach-head of the Hitler Youth, ten years in prison. 20. Arthur Seyss-Inquart-commissioner of occupied Holland, death by hanging. 21. Albert Speer-head of armaments and Hitler’s friend, twenty years in prison. 22. Julius Streicher-publisher of anti–Jewish newspaper, death by hanging. These men were the primary people at the Nuremberg trials and the men that Gerecke and O’Connor tried to reach. The question becomes did any of these men repent and if so have they have been forgiven by God for their enormous crimes and are they in heaven? For some, the idea is repulsive at face value and given the magnitude of their crimes understandable from a human point of view. A Christian however has to view the situation through the lens of Scripture regardless of how they may feel about it. Viewing the situation through Scripture is what Pastor Gerecke did and in part three of this series I will give his opinion about those he ministered too.